​To ensure our student safety and a smooth traffic flow, please follow the school's drop-off/pick-up rules and traffic flow maps. Thank you for your collaboration! ​Please be aware, that drop-off and pick-up rules can change on a daily basis due to road construction around the Como neighborhood. Van Slyke: Do not block the alley, driveway, or bus stop. 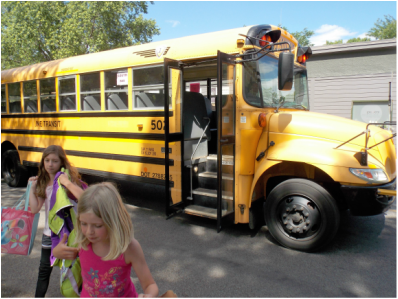 The school provides school bus transportation with a contracted bus company. Many families have made carpooling arrangements. The school will not arrange the carpool for you. Many students walk to school. Please be sure children walking on their own understand and practice safe pedestrian practices. If you wish to park in the neighborhood and walk students directly to school, please avoid parking on Como Avenue and Van Slyke Avenue. There is ample street parking on Churchill, Oxford, Argyle and Jessamine. School supervision is provided between the hours of 7:50 a.m. and 3:30 p.m. for K-8 Monday through Friday. On Early Release Wednesdays, supervision is provided between 7:50 a.m. and 1:00 p.m.
Students who are not picked up during the designated time will be brought to the Front Office. Please see the Family Handbook for further information. Pick-up on Early Release Wednesday Days (check school calendar for dates): 12:45 - 1:00 p.m.
Grades 3-8: Como Ave - Main entrance (where the playground dome is located). Vehicle drop off is directly in front of school steps. Drive slowly and stop for pedestrians AT ALL TIMES. School provided signs are required for student pick up. Place on the front door of your vehicle with the full name, grade, and class of all students you are picking up at TCGIS (Ex. John Doe 3B). Cars with students in grades 3-8, please use Como Avenue. Cars with mixture of grades including K-2 students, please use Van Slyke Avenue. Parents who wish to walk students to the building door may park on Churchill, Oxford, Argyle or Jessamine Street or in lots between Como Park Pool and McMurray Fields. Do not park on Van Slyke or Como Avenue on either side of the street between 7am and 5pm. This causes traffic congestion and dangerous conditions, especially in the winter. Police officers will be on site occasionally to ensure the safety of all community members and students. Pull all the way up in the drop off/pick up lane; staff will assist students in locating their vehicles. Please have children exit or enter on the sidewalk side of the car. Please do not get out of your car unless absolutely necessary when dropping students off in the vehicle lines. To avoid traffic and idling, we ask that you do not arrive excessively early for pick up. You can park in the neighborhood if you arrive early. Avoid using cell phones in the pick up line. By law, cars must remain 5 feet clear of all driveways and alleys. Avoid parking in carriage walks and in front of fire hydrants. During drop off, please be attentive - there is significant sun glare on Van Slyke Ave and exiting the driver's side (parents or children) is very dangerous.